It was not fair maidens in distress that was the cause of much excitement at the Fishery last week but damsels of the nymph fly sort, which nowadays come in various dressings and sizes from the originals of year gone by. With the cold North East wind not letting up for most of the week a lot of fishers were scratching their heads as to what to use in the unseasonably cold conditions and without a doubt the no 1 contender proved to be the damsel nymph. Matthew Will showed this to be the case catching 13 fish on what he recorded in the book as ‘old school’ damsels and conversely Robert Riley recorded 11 fish caught using ‘new school’ ones. It maybe proves the current theory that educations standards have slipped. 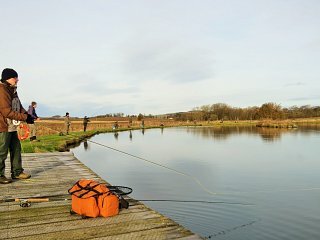 Other damsel users were Trevor de Almeida who netted 13 fish, Ian Hutchison on holiday from Glammis with 11 fish and Paul Ingram from Newmachar with 6 fish. George Pirie had an excellent day bringing 21 fish to the net on yellow dancers and Steve Prince had two outings where he also used this lure along with buzzers and diawl bachs to account for 11 and 7 fish respectively. Looking through the retuns book there was also a variety of other fly’s working with R Lessells getting 19 fish solely on a lime green buzzer, while father and son, Mike & Garry Frost landed 9 & 12 fish respectively on a variety of lures including the Ali McCoist. Doug Mair, one half of the blobby boys enjoyed a day using small buzzers and his reward was 12 fish and James Will used a snatcher and buzzer combination to get his 9 fish. With calmer and slightly warmer weather forecast for the next week it will be interesting to see what effective fly trends emerge.